Book your private party in our downstairs bar, Cost is $150.00 which will be applied towards bartenders tips. If tips exceed the amount, then no charge to your card will be applied. The Map Room will start Celebrating St. Patrick's Day on Saturday & Sunday March 16th & 17th at 9:00 am and it will end the Gala Celebration at 2:30 am, That's 17 1/2 hours of Celtic tradition. There will be food specials along with the regular menu. In Cleveland, though, there’s the NFL draft, a bottomless harvest of hope and the peak of the local sports calendar. 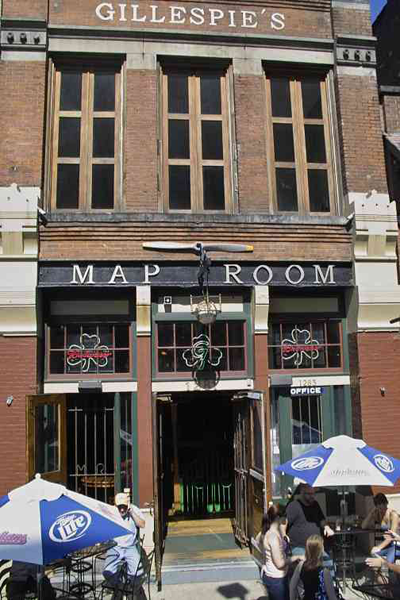 For the third year in a row, there’s no better way to seize the momentum than at Gillespie’s Map Room on West 9th Street downtown, starting at 6:00 PM and lasting through the draft’s first round on Thursday, April 25. This year Cleveland Frowns will be be co-hosting the party with their with our friends at Waiting for Next Year, and otherwise the arrangements will be pretty much the same as always. Jim Beam is sponsoring (which means drink specials and free shots as moderated by friendly representatives of the distillery), domestic drafts will be $2, and there will be free (award-winning) pizza and appetizers again. Nobody has ever gone broke at this party or left hungry. Renewed faith in humanity, on the other hand, is virtually guaranteed. There’s no day like NFL draft day in Cleveland, and there is no social media, there’s only friends. Naturally, draft day is as good a time as there is to make new ones and also to finally meet old ones in person. Gillespie's Map Room (1281 W. 9th St.) is located in the Historic Warehouse District of Downtown Cleveland. Voted Cleveland's BEST Downtown Watering hole; the Old World Pub and Pizzeria is known for their award winning pizza and extensive domestic/import beer selection.